Reinforce good hand hygiene with your kids. School-age children need 9-10 hours of sleep per night to keep their immune system boosted. I always ask kids that come into the clinic what time they go to bed and I am always surprised when they tell me that their bedtime is 10:00! Lots of fluids and well-balanced meals are important for optimum health. If you are questionable about whether to send your child to school remember the following....children have different tolerances for discomfort and illness. Even with the common cold, some are able to function just fine while others are miserable. If your child is coughing continuously, he or she won’t be able to concentrate and will disrupt others in the class. If you decide to send your child when they are borderline of being ill, it is a good idea to call or e-mail me. Please make sure I have your current contact information. Nothing is more miserable for a child than to have to wait for hours in the clinic when they feel terrible because we cannot track down a parent. Remember our attendance policy - a child must be fever-free for 24 hours (with no medication) before returning to school. Please let me know if your child is diagnosed with the flu, strep or any other communicable disease. 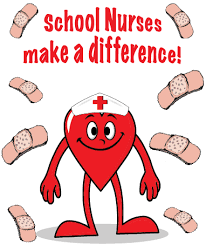 Thanks for helping to keep our students healthy!